Mack Calvin was born July 27, 1947 in Fort Worth, Texas and played seven seasons, (from 1969 – 1976), in the now-defunct American Basketball Association (ABA) and four seasons in the National Basketball Association (NBA). 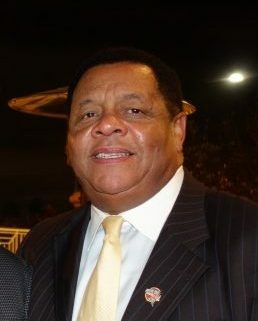 A 6′0″ point guard from Long Beach City College and the University of Southern California, Calvin was a 14th-round draft pick of the NBA’s Los Angeles Lakers in 1969. However, he began his professional career with the ABA’s Los Angeles Stars, averaging 16.8 points per game in his first season to make the ABA All-Rookie Team. The following season, he averaged a career-high 27.2 points for The Floridians, in the process setting the ABA records for most free throws made (696) and most free throws attempted (805) in one season. 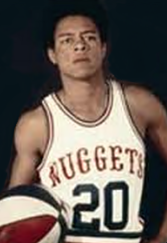 Mack Calvin also played for the ABA’s Carolina Cougars, Denver Nuggets, and Virginia Squires before the ABA merged with the NBA in 1976. During his ABA career, he tallied 10,620 points and 3,067 assists and appeared in 5 All-Star games. He spent his four seasons in the NBA with five teams including, the Los Angeles Lakers, (1976-77), the San Antonio Spurs, the Denver Nuggets (which had joined the NBA in 1976), the Utah Jazz, and the Cleveland Cavaliers.